What are FC Receptors and functions? FC receptors are found on immune system cells known as phagocytes, which are able to consume harmful substances, or antigens. Fc receptors, as its name shows, are able to attach itself to what is called the Fc region on an antibody. Antibodies are special proteins produced by immune cells, which bind to antigens such as microorganisms, toxins or allergic substances. They are able to neutralize them or mark them for destruction by the immune system. When an Fc receptor on an immune cell binds to an antibody and its attached antigen, this can trigger phagocytosis, where the antibody-coated antigen is consumed. As is known to all, based on different types of antibodies, there exists different specific antigen for each types of antibodies. This means that different Fc receptors also exist, each able to bind to an antibody at its Fc region. Antibodies are also called immunoglobulins, Ig for short, and the type named IgG is most commonly found in the blood. Generally speaking, there are three main classes of Fc receptors, involving Fc-gamma receptor, Fc-alpha receptor and Fc-epsilon receptor. Each type of Fc receptors contains several subtypes based on genetic homology. For CUSABIO's Fc receptors, each protein will undergo our standardized quality control process before shipment. For example, CSB-AP005111HU is a protein named Recombinant Human Low affinity immunoglobulin gamma Fc region receptor III-A (FCGR3A). In the process of developing, our R&D team detects its purity by SEC-HPLC, and verify the purity greater than 95%. As the figure 1 shows. 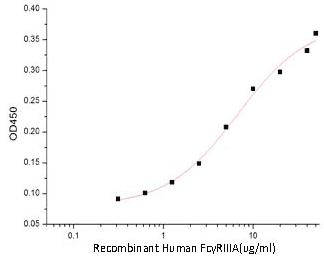 Additionally, as shown in the figure 2, The ED50 of FCGR3A as determined by its ability to bind Human IGHG1 in functional ELISA is less than 20 μg/mL. Moreover, for the series of Fc receptors, we also use the method of Surface plasmon resonance (SPR) to detect the proteins interaction. 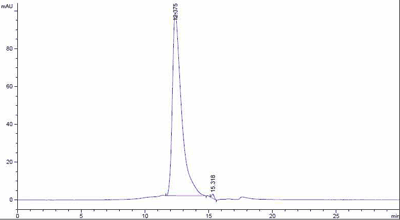 In this example, immobilized Human FCGR3A Protein on CM5 Chip via anti-His antibody, can bind Anti-HER2 Humanized Mab with an affinity constant of 9.746×10-8M as determined in a SPR assay (Biacore T200). The result is shown in the figure 3. Figure 3. The Surface plasmon resonance (SPR) test of FCGR3A. Besides, like other protein products, we also take the measure of protein concentration, molecular, and endotoxin content.